It has been a huge couple of weeks for me. Last week I was at the PME Summit discussing how Brazil can develop a better entrepreneurial business environment for small and medium enterprises, and yesterday I was invited by Infinity Conferences and Exhibitions to attend Brazil’s first forum on Bioeconomics, Fórum de Bioeconomia – Desenhando uma agenda para o Brasil (developing the agenda for Brazil). What Bioeconomics is I will explore in a moment, but I have to say that this forum had a huge impact on me, not just intellectually but quite emotionally too. I left the event deep in thought, and in this article I will attempt to explore the many themes discussed. What was discussed at this forum will impact on each and every one of us in the coming years, and it was therefore to their great credit that CNI (Brazilian National Confederation of Industry) and Harvard Business Review Brazil were able to host such an important and wide ranging event with some of the world’s leading proponents in this field. I have used the above diagram a lot to help explain my own way of analysing systems, and the forum is an almost prototypical example of this framework in action. Bioeconomics is about a new model of business, and in many ways it can be described as a new paradigm for business. Sometimes I can get up on my high horse and complain about the misuse of this term, and I know that many times I should not, since the term paradigm is being used by people to convey a sense of needing a new way of thinking. This is fine, but what can limit our ability to take on a new way of thinking or a new paradigm is our mental models, or world views. These we will often hold on to at any cost. What I am interested in is how the study of complex systems can help us both change our mental models of reality, and also how the study and comprehension of complex systems, especially those in nature can provide us with new templates of thinking in order to better comprehend new business models (and many other new ideas such as social networking, creativity and innovation for example). In the forum yesterday I saw the wonderful dynamic interplay between all these levels of thinking and comprehension, and so I will refer back to this figure as we proceed. Opening the day were three keynote speeches by Juan Enriquez, the CEO of Biotechonomy and founding member of the project of life sciences at Harvard Business School, Rodrigo Martinez, Chief Strategist of life Sciences at IDEO and founding member project of life sciences at Harvard Business School, and Pedro Passos, previously the CEO and now Co-Chairman of Natura, Brazil’s leading manufactuer of cosmetics and personal care products, which due to it’s philosophy of care for the environment and commitment to social development of its workforce is regularly voted of one of the world’s most sustainable companies. I have recently joined the BCI network – Biomimicry for Creative Innovation and this is a network of consultants and teachers who are helping to develop the philosophy of business inspired by nature. In relation to my own mental models, I was very excited to learn about the notion of bioeconomics, as this was a new term to me, and to me it suggests a new way of thinking of economics and economic systems which are in harmony with nature, and which are based on natures’ own business models, patterns of consumption, use of resources and design creativity. It was therefore with great interest that I listened to Juan who told us about what bioeconomics was (a term he coined in 1996 with Rodrigo), what it means for business, and how it will affect our lives. Juan Enríquez is recognized as one of the world’s leading authorities on the economic and political impacts of life sciences. He is a highly recognized researcher in genomics and has been described as “a visionary entrepreneur”. He is a Managing Director at Excel Medical Ventures, a life sciences venture capital firm, and the chair and CEO of Biotechonomy, a research and investment firm helping to fund new genomics firms. As well as being a best selling author, he has authored numerous papers, including Life Sciences Revolution: Changing the Language of Business and Gene Research, the Mapping of Life and the Global Economy both published in the Harvard Business Review. Juan began by noting how the economic turmoil we are experiencing had been created by governments who had not solved any problems, just delayed them due to their policies of solving debt problems by creating more debt, a situation which is clearly not sustainable. Brazil however was in a strong position, and would soon be able to find buying opportunities from distressed countries selling their assets, and this was where fortunes were made, hence crises can be opportunities. Juan used as a metaphor Katsushika Hokusai’s painting The Great Wave off Kanagawa (his slide of which I have recreated above). The digital revolution of the last 30 years will be seen as tiny compared to the much greater wave of the life sciences revolution. Economic crises come and go, and they are not the most important things in the world. What was important was to understand how in Juan’s words “wealth derives from code”. Those countries who are wealthy are the ones who have and do understand code. Juan Enriquez discussing cave art, language, humans, animals and the development of code. Juan described the evolution of code throughout the history of humans, from cave art to the modern era, and made the point that the use of code is the one thing that separates us humans from animals. Humans have the ability to transmit information through space and also time, hence our forefathers from generations ago can teach new and future generations. In our history, the wealthiest nations were, and still are the ones who have understood code. In our current digital revolution the wealthiest nations are the ones who understand computer code, an example being how India is far more competitive than Latin American countries. The process Juan described was one where we first learn to read code, then we learn to copy code, and finally we learn how to change the code so that we can pretty much what we want, such as the creation of genetically cows in Argentina to produce human milk, which contain EPO, a medicine which could cure cancer. He discussed artificially growing new human organs such as bladders, ears and teeth. He discussed all the companies such as Dupont, BASF, Toyota and GE all transforming their businesses via opportunities these developments in life sciences are bringing. 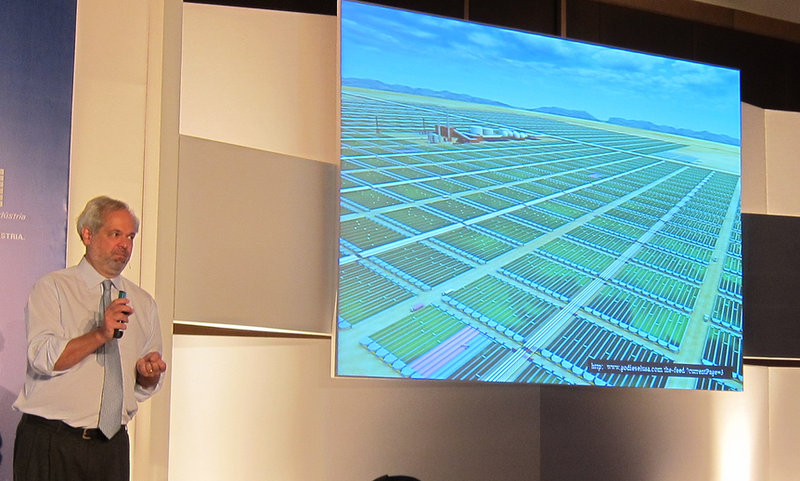 The only slide he showed us which was of a future development not yet fully realised was of developing a biofuels farm from algae. Juan, like Rodrigo is Mexican and he spoke about the fact that latin American companies are playing catch up in the digital age. No Google, Microsoft or Facebook has come out of South or Central America while India has pockets of excellence in coding. As he said to us, “economies grow when small start-ups become very large, and these are the ones who understand code”. This then is the opportunity for Brazil, with its vast natural resources to become dominant in the field of bioeconomics and life sciences. Following Juan’s talk came Rodrigo Martinez of IDEO, one of the world’s most creative design agencies, founded by Tim Brown, creator of Design Thinking. I have written a couple of articles about Tim and design thinking, and it was therefore really interesting not only to hear Rodrigo, but also to have lunch with him to discuss many issues coming out of what he had presented. Rodrigo presented an interesting slide looking at where we were in the bioeconomics revolution. He mapped out the evolution of business processes since the 1950s, but suggested that “we do not really know what the core framework for business strategy is.” This is quite an insight, as it explicitly recognises that we are in a period of chaotic transformation, a transformation of our mental models, and a period where there is no current shared meaning on where we are heading. This notion of shared meaning is important to me, since although as Juan stated we may be masters of the code, are we really masters at achieving consensus and a shared meaning behind the technological developments? Rodrigo provided us with a very telling insight into the creative culture at IDEO, and continually emphaised the importance of play. He told us that often at IDEO there are projects which “have nothing to do with client projects, but everything to do with client projects”. One example was the fact that he builds bacterial resistors on his desk in a petrie dish for fun. This notion of creative play is a huge lesson for Brazil, and many of the delegates saw just what kinds of facilities and ventures are possible in an economy such as the USA. Rodrigo talked about the many types of shared work spaces such as Tech Stars, 21212 and Rockespace where people from diverse backgrounds gather to meet, clash, and where creativity emerges. A great idea I liked was his mention of “Coffee with no agenda” where cafes are running events for executives, academics, students, creatives where literally there is no agenda and free flowing dialogue is the nature of the day. Brazil really needs to bring together people from diverse backgrounds and also to create spaces for creative play, and this does not have to be done with a huge amount of investment, just imagination. Rodrigo also mentioned the book Regenesis which has just been launched that week. The authors of this book created 40 bilion copies before launch by coding it in DNA. This of course is a game changer for the computer industry, and also begs the question of whether or not we can create an interface to our own bodies, and also whether or not we want to give our own genome data away. In the UK the British government have proved to be hugely inept in securing data about the british public, with many highly embarrassing and high profile lapses of security, so I for one hold no trust in them to keep my genome data secure, especially when they are looking at every way possible to both control the masses and make money having bankrupted us with debt. For Brazil Rodrigo noted that Brazil requires a regulatory framework for the bioeconomy otherwise yet again it would fall behind. This would a theme that the afternoon panel sessions would return to, and so I will discuss that shortly. When discussing mental models and the history of science to business students, I sometimes show them the picture above of a mechanical duck. I use this as a metaphor when discussing science in the middle ages, and how what we recognise as the modern scientific enterprise began as an endeavour not only to understand nature, but to master and control nature. As I was listening to Juan and Rodrigo I was contemplating what their mental models of nature were. Although the science has changed to the point where we have surpassed Vaucanson’s vision of creating automatons to be able to create clones, I did wonder about their world view of nature. Is nature there to be exploited purely for financial terms, is nature there to be understood to be able to create sustainable technologies such as not raising cattle but growing leather in the shape of coats 9an example of Juan), or would there be any discussion of what Satish Kumar describes as an understanding of the intrinsic value of nature? (See my article Wise Wolves Build their House upon the Rock). The answer would come with the final presentation by Pedro Passos of Nature. This was phenomenal for me, since although Pedro was of course discussing business opportunities in bioeconomics, and Brazilian opportunities in particularly, his expression in his mental models in his expression were clearly informed by a systemic appreciation of the interrelatedness of mankind in relation to his environment, and the need for us to live in harmony with nature. He noted how Brazil even today provides financial incentives for traditional companies such as car manufacturers, thus incentivising people to buy cheap cars when in fact São Paulo is choking on carcinogenic polluted air. (For photos and a discussion see my article Authentic and Counterfeit Wholes in São Paulo.) In his discussion afterwards he noted the many issues in Brazil, such as the fact that it is a country with no long term vision, being only able to think in the short term, the fact that because the dictatorship Brazil had suffered a ‘lost decade’, and the monumental bureaucracy. Pedro is someone who is clearly thinking about the future of Brazil, and the fact that it is suffering from a “lack of leadership”. As well as developing the technology he noted how we also need to change people’s behaviour, and this I would say is what I refer to as the transition of consciousness. Pedro noted how the government in Brazil is about 50% of the economy, but there is a new generation of entrepreneurs emerging. Brazilians will have to answer this question, but is it now time to really develop new initiatives independently in order not to miss the boat yet again? Maria and I had lunch with Rodrigo, plus Kevin Huyzen a Dutch business student here in Brazil researching bioeconomics for the Dutch government, and Felipe Fornaziere from Siemens Brazil. This was a wonderful interactive session, since here we saw the clash (in a positive way) between the just-do-it creativity of the US but with the additional British, Mexican and Brazilian perspectives. Maria spoke a lot about the huge psychological impacts on the Brazilian nation who are still suffering from a brutal dictatorship, many of those who were involved are still politically active today and where being imprisoned for corruption is no barrier to standing again for the highest positions of political power. During the dictatorship philosophy departments were banished, and this she felt has had an impact on Brazilian people’s fear and distrust of others, and their desire and ability to enter into analytical dialogue such as how to shape their collective future. Although both Juan and Rodrigo are both Mexican, they both acknowledged the limitations of their own understandings of the complexities of Brazilian culture, but this is a huge lesson for those in other countries wishing to come here to understand opportunities, such as the Dutch government. We are living in times of great opportunity for Brazil, but unless it is able to address also these issues that run deep in the national psyche, such as collective low self esteem, then yet again Brazil will be exploited as opposed to joining the stage as an equal. Throughout the day there were three Talk Show style panel sessions hosted by Globo journalist William Waack. The afternoon sessions explored opportunities and challenges for Brazil, and then public policies for the development of bioeconomics in Brazil. Maria Carmelo Brito, Coordinator for the Commission of Patents at ABPI told how it takes Brazilian companies between 10 – 12 years to register a patent, such is the slow pace of the Brazilian legal system encumbered by a huge back-log of work.The discussions were wide-ranging, and here we saw the Brazilian culture for the discussion of complex issues at work, being well able to describe the many problems and challenges at length, but perhaps less able to articulate workable solutions. We have a long way to go in this conversation. What do we mean by Bioeconomics? I feel his final point really is important. Next year there will be the second forum in Bioeconomics, and it is here that Paulo sees the opportunity to really be able to go into more detail in all these areas.As we have seen the speed of technological developments and what we are able to do now has fast exceeded our ability to comprehend the meaning of these technologies and place them within a legal, regulatory and business framework. This therefore shows just how important this forum was to Brazil, especially as CNI and Harvard Business Review both brought some of the most important Brazilian and international thinkers on the subject, but also created an event with a rich breadth of attendees from business, academia and government. As was to be expected there were plenty of opportunities for networking, such as Maria and I discussing the sustainability aspects with Alexandre Mac Dowell, Director and Vice President of the Brazilian Association of Sustainability Professionals. Yes it is important for Brazil to play an active role in Bioeconomics, but in Pedro Passo Brazil has shown in this forum that it can be a leader not just in commercial exploitation of technological developments, but in taking a leading role in protecting some of the most biodiverse regions on the plant. Bioeconomics is a wonderful term as its ambiguous nature invites us to have a more profound dialogue regarding the future of our relationship to nature. What relationship is that to be, and what will our mental models be? Will we finally be able to change from a ego-centric view of mankind on top of a pyramid, or will we, like Pedro Passo, move to having a more systemic view of mankind’s embededness within nature, where we understand how to live as he says in harmony with nature, for the benefit of all living beings. This is the level of conversation that was being held at the forum on bioeconomics. This was such a valuable day, since it showed us how we need to be creative in finding solutions to our systemic problems, and how we need forums such as this for such an exploratory dialogue to take place. As Paulo Mol concluded, he really sees CNI as being a key player in Bioeconomics, bringing such a diverse range of people and interests together, and I look forward to future forums where the hard work of developing the framework for Brazil will take place. I know this has been a long article, but I said at the start what an impact the day had had on me. I have not even covered all of the talks by all of the participants, and the vast range of probing questions asked by delegates, but I hope that this has given you a useful overview of the state of Bioeconomics in Brazil, and what a good opportunity it provides us with for developing a harmonious partnership with nature. I am of course extremely grateful to CNI, Harvard Business Review and Daniella Carvalho of Infinity for my invitation and the opportunity to participate in this groundbreaking event.